AIP is a company that produced a treasure trove of low budget direct-to-video films that specialized in action movies, as the company name implies. Being a low-budget production company, you would think they would have been familiar with their forebear American International Pictures, the original AIP. Why they used that name is a bit puzzling. Even though they made other types of genre movies, it was with action that they hit their stride. Although they ceased production in 1994, they left behind a legacy of VHS gems such as: Kick Or Die (1987), Night Of The Kickfighters (1988), and Night Trap (1993). 1. You are obsessed with aliens and have seen every other movie or TV show dealing with aliens ever made. 2. You are obsessed with AIP movies and have seen every other one ever made. 3. You are an Erik Estrada fanatic and you have seen every movie he's ever made. Trying to ride the coattails of other popular alien flicks such as Alien (1979), Aliens (1986), Demon Seed (1977), The Terminator (1984) and E.T. (1982), while borrowing liberally from each one, the final product has the production value of the E.T. video game for Atari, which was subsequently buried in the Nevada desert, as wags might suggest all copies of this should be. 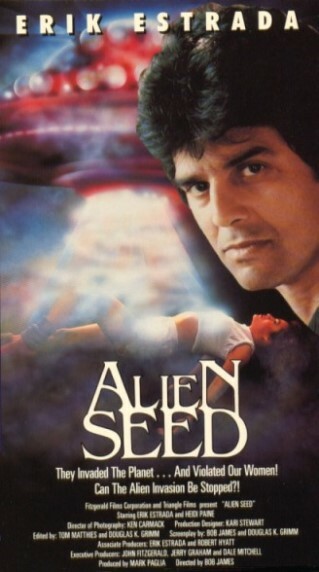 The plot: Apparently some broad was impregnated by the Alien Seed. In the movie this is referred to as an “IBI”. It was claimed this was a term used by alien experts. That is highly doubtful. To pad out the running time there is a lot of chasing, shooting, and Erik Estradding around. It is not clear what is going on and to further pad out the running time on top of a pretty extensive pad job, there are several alien-related dream sequences. The acting is typical AIP acting, so you know what you're in for. To the untrained eye, the acting may seem “bad”, but it is amateurish fun and you can’t help but smile. Unfortunately, the film stock is shoddy, dingy and grimy looking, making it a tough sit for your vision. Alien Seed was directed by Bob James and it is his only directing credit to date. The writer Douglas K. Grimm was in the immortal AIP classic Elves (1989) as “Dead Santa”. 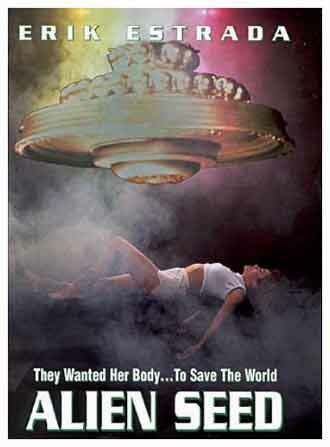 Additionally he directed the awful Traci Lords vehicle Laser Moon (1993). This desperately needed more Erik Estrada. His portrayal of Dr. Stone, the villain of the piece, livens up the otherwise dreary proceedings. If you have seen every episode of CHiPs, Night Of The Wilding (1990), and Twisted Justice (1990), and need your Estrada fix, watch this today!